Happy Thanksgiving, everyone! I hope you are enjoying the day with family, friends, and the most amazing of foods. Once the feasting ends, and you are looking to “detox” from all the deliciousness that Thanksgiving brings, filling up on a lot of greens is a great way to do it. This Spicy Herb Salad Recipe that my father-in-law taught me, is one of my absolute favorite salads ever. It’s just a few simple ingredients, but the flavor and textures that it delivers are incredible. With no lettuce to be found in this salad, the base is nothing but fresh, finely chopped herbs. Enhanced with onions, jalapeños and serrano peppers, then dressed with lemon juice, garlic and olive oil, it’s a simple yet sophisticated salad that is light, flavorful, and a fantastic change of pace. The parsley really helps to de-bloat you too, which is an added benefit. There are a lot of peppers in this salad, so feel free to use less if you don’t want it too spicy. Be aware that the recipe as posted, is very spicy. If you want to shake things up a bit and try something new and unique, this Spicy Herb Salad Recipe will definitely do the trick. Enjoy! Fresh, bright, spicy, and mouthwateringly flavorful, this low calorie salad is way beyond a traditional lettuce based salad. By using nothing but fresh herbs and peppers as the base, each bite is filled with exceptional tastes and textures. 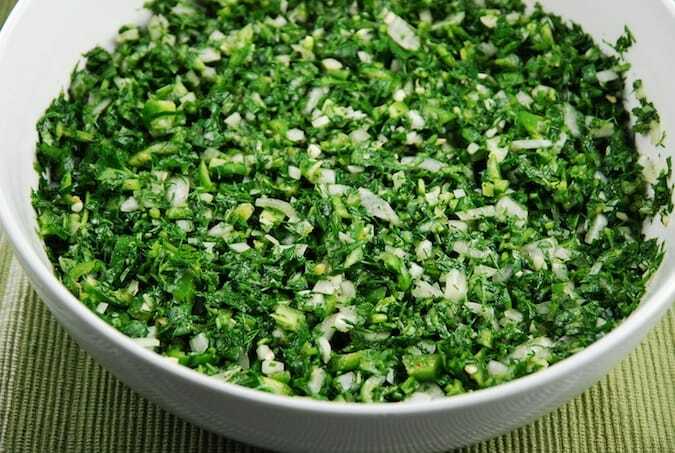 In a large bowl, combine the parsley, dill, cilantro, onion, scallions and peppers. In a small bowl, whisk together the olive oil, lemon juice, garlic and salt and peppers. Drizzle over the greens, and toss well to combine. Season with additional salt and pepper as needed. Sounds amazing!! Does it keep well once dressed in the fridge or does it get real soggy? This looks delicious! However, you refer to garlic in the instructions, but it’s not in the ingredients list. How much garlic should be used? Opps…I must have forgotten to add that to the ingredient list!! Thanks for catching that. I used 4 cloves of garlic, minced. And I just updated the post to include it. Thanks again!